Russian Foreign Minister Sergei Lavrov recently completed a tour of Latin America that was notable for its focus on countries usually seen to be outside Moscow’s sphere of interest. With traditional ally Venezuela and the leaders of Brazil and Argentina, Russia took the opportunity to forge closer contacts with Guatemala, and in particular with Colombia, besides visits to Nicaragua and Cuba. Russian Foreign Minister Sergei Lavrov has concluded his trip to Latin America. His itinerary was rather unusual for a Russian politician: Besides the traditional Moscow-friendly countries such as Cuba and Nicaragua, Lavrov also visited Colombia and Guatemala, which he had never been to before. The choice of visiting Colombia is possibly related to the fact that a series of Latin American countries with Moscow-friendly leftist governments are experiencing a crisis. Brazil is going through a large corruption scandal linked to the shady deals that the country's largest oil company, Petrobras, made in the past, something that has significantly affected the standing of President Dilma Rousseff. Argentine President Cristina Kirchner, who has warm relations with Russian President Vladimir Putin, does not have it any easier. The country's public prosecutor accuses her of having impeded an investigation into six high-ranking Iranian politicians who were involved in the preparation of a terrorist act against a Jewish Cultural Center in Buenos Aires in 1994. In October this year Argentina will be going to the polls, which a candidate from the right is expected to win. Meanwhile, the socio-economic crisis in Venezuela, Russia's main ally on the continent, has reached such a level that Caracas currently has no time to receive guests. The country’s precipitously deteriorating relations with the U.S. are aggravating the situation for the unpopular government of Nicolas Maduro. Recently the White House has labeled Venezuela as a "direct and open threat to America's national security." 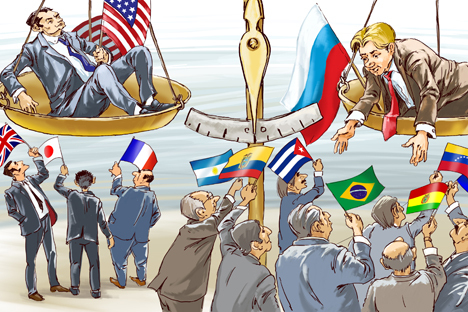 In these conditions Moscow has embarked upon a search for new possible allies and partners in Latin America. One of them could be Colombia. For many years the Russian Foreign Ministry had considered the country "America's patrimony." Bogota is tied to the U.S. through a series of large agreements on fighting terrorism and drug trafficking, which provide for the quartering of U.S. troops on Colombian territory. However, when in 2010, instead of the avowed pro-American President Alvaro Uribe, the country elected the more neutral Juan Manuel Santos Calderon, Colombia's foreign policy became more diversified. In 2014, during the BRICS Summit, Calderon became the first Colombian president to meet Putin. Calderon's recent talks with Lavrov were mainly held behind closed doors. However, a comment made by the Russian Foreign Minister after the meeting shed light on many things: "We appreciate Colombia's balanced position regarding the Ukrainian crisis." Before that the Russian Foreign Ministry had noted on several occasions that Colombia was not adhering to the sanctions imposed against Russia by the U.S.
Obviously, it was very important for Lavrov to secure, if not Latin America's full support for Moscow, then at least its neutrality in the confrontation between Moscow and Kiev. Now, when Russia has found itself in harsh isolation, such neutrality is worth a lot. Lavrov also searched for support in Guatemala, where besides talks with the country's government, he participated in a meeting with the Foreign Ministers of the Central American Integration System (SICA). The eight countries that make up this organization expressed an interest in establishing multilateral dialogue with Russia. Mutually beneficial agreements were even concluded with several of them. In particular, Lavrov and his counterpart from Salvador, Hugo Martinez, signed an intergovernmental agreement on waiving travel visas for the two countries' citizens. Moscow's traditional allies Cuba and Nicaragua have also assured Lavrov of their full political support for Russia. Nicaragua was one of just three other countries to join Russia in recognizing the independence of the breakaway “republics” of Abkhazia and South Ossetia in the North Caucasus. In the course of the talks between Lavrov and President Ortega both sides stated that Nicaragua and Russia's position on international issues converge and that both countries adhere to principles of resolving all international conflicts peacefully. Daniel Ortega criticized the U.S. and EU sanctions against Russia, saying that this kind of policy will "lead nowhere." In Havana, Lavrov apparently received comprehensive information not only on Cuba, but also on Venezuela. The crisis with Maduro's government and the almost 50-percent reduction of Venezuelan oil supplies to Cuba has motivated Havana to start looking for ways to normalize its relations with the U.S. in hopes of canceling the economic embargo and re-establishing diplomatic relations. However, Havana is simultaneously interested in preserving trade and economic relations with Moscow, since the island contains infrastructure built in the Soviet era. Concerning contacts between Cuba and the U.S., Lavrov underlined once again that Havana's dialogue with Washington does not worry Moscow, while the Cuban leader promised the Russian minister that political control will remain in the hands of the current government and that Moscow has nothing to fear.